A full days’ exploration into the creative combinations of trios tricks. There are added dimensions to working as a three. The ability to listen and absorb in order to collaborate are some of the key qualities to successful trio balancing. 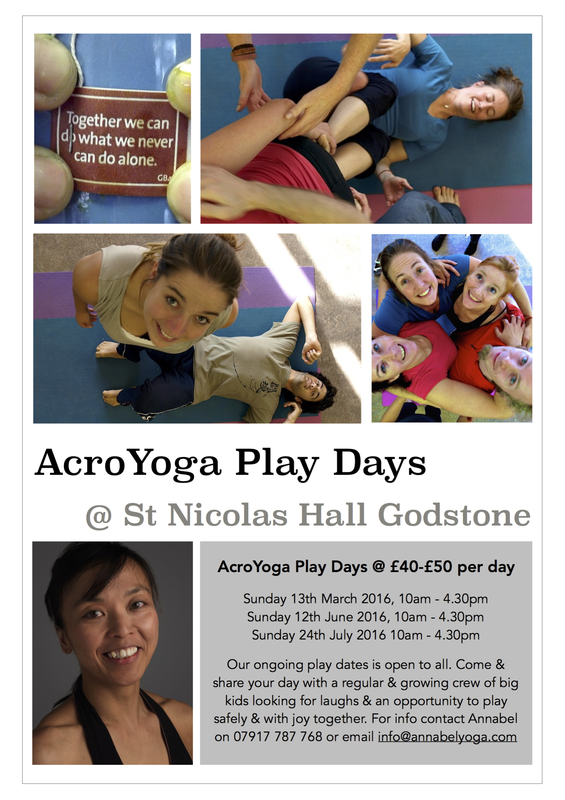 Experience in acro-balancing and acroyoga is essential to receive the most from the day. We will begin the day with a strong warm up to prepare the physical and mental body for the day ahead. There after we will work on a trio flow to explore the calibrations and nuances of working as a three. We will explore a number of progressive trios pyramids; how to get into and out of them with grace, ease and precision and more importantly without the need of spotters. However experience in spotting will ensure the safety and progressive successes throughout the day. There will be some time allocated to good spotting techniques. You are most welcome to bring your regular training partners however we will encourage different working combinations to allow for collective and supportive outcomes. We will learn that the groups success depends the active inclusion and participation of everyone in the group. With trio tricks, you will learn that each person has an equal part to play. We will end the day, where possible with trio massages, where by we will take turns to both give and receive. Essentially a full day of collective cooperation, connection and kinship. Costs: £25 per person for early bird bookings made by the 31st May there after £30 and are made directly with the studio. 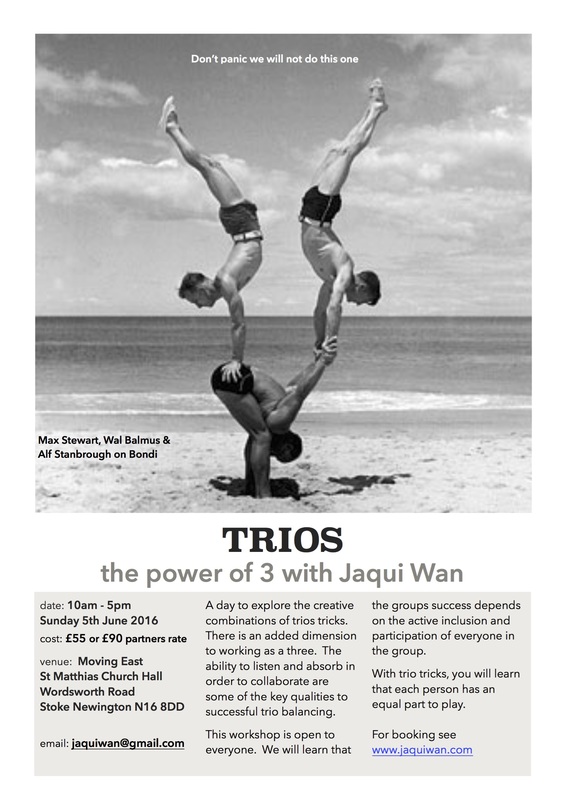 A day to explore the creative combinations of trios tricks. There is an added dimension to working as a three. The ability to listen and absorb in order to collaborate are some of the key qualities to successful trio balancing. We will begin the session with a short warm up there after work on a trio flow to explore the calibrations and nuances of working as a three. This workshop is open to everyone. We will learn that the groups success depends on the active inclusion and participation of everyone in the group. With trio tricks, you will learn that each person as an equal part to play. We will end the session with, where possible, trio massages; we will take turns to both give and receive. Essentially an afternoon of collective cooperation, connection and kinship. Please contact the studio for bookings. We will introduce a basic supine leg massage sequence that will help cultivate deep listening, compassionate touch and the roles of giving and receiving. We will introduce suspended therapeutics, involving a base and flyer. The base grounds and suspends the flyer with their hands and feet to create the potential to release tension and muscular holding patterns. The passive nature of the flyer enables the base to sculpt the flyer into a variety of shapes that stretches and opens the flyers upper body. 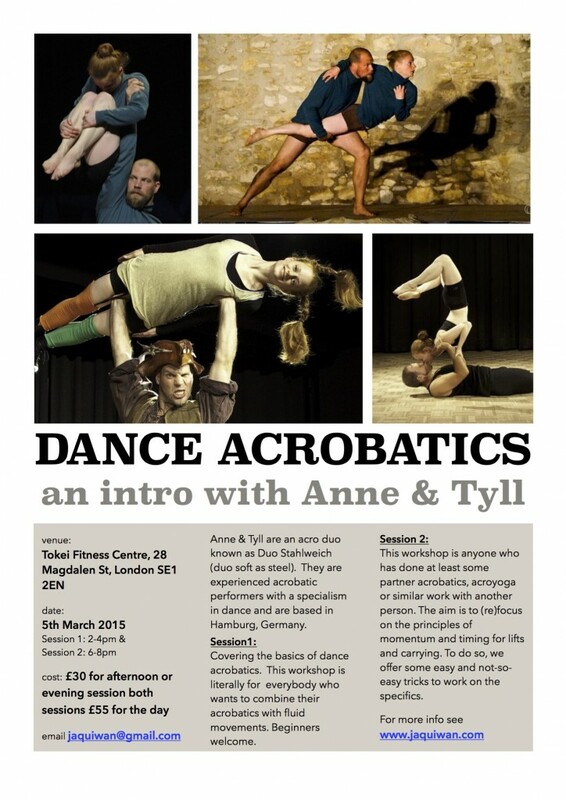 Open to all and especially those who have studied or are studying Thai massage or other forms of body work.